URL has been added to end of first sentence under Availability and Pricing section. Additionally, final bullet point under Great for Development, Design, and IT Pros has been revised. Final customer quote under What Customers are Saying About Parallels Desktop 10 for Mac has been revised. Parallels® today launched Parallels Desktop® 10 for Mac (www.parallels.com/upgradepd10) and Parallels Desktop 10 for Mac Enterprise Edition (www.parallels.com/business), the industry-leading software for running Windows applications on Macs. New built-in intelligence and support for Apple’s latest operating systems – including OS X Yosemite1 – greatly improves ease-of-use for both business users and consumers, allowing them to forget about the operating system and focus on the task at hand. Starting Aug. 20th, current users can upgrade to Parallels Desktop 10 for Mac at www.parallels.com/upgradepd10. For new customers, Parallels Desktop 10 will be available for purchase at retail and online stores worldwide and via the Parallels website starting Aug. 26th. Parallels Desktop 10 will bring many of the announced features of Mac OS X Yosemite1 to Windows and Windows applications, supporting iCloud Drive, iMessages and SMS text sharing from Windows, and control of virtual machines from Spotlight preview and Finder QuickLook. New ease-of-use improvements include Wizards that guide users through optimizing their experience, improved performance and battery life, and improved usability between operating systems so that people can complete tasks more quickly. Parallels Desktop 10 gets out of the way so customers can think less about the tools being used and more about what’s important. It also offers the choice and freedom to use whatever operating system fits your needs – including OS X Yosemite, OS X Mavericks, Mac OS X Mountain Lion, Windows 8, Windows 7, Chrome OS, Android and a number of Linux operating systems – all on one computer. Parallels is also updating Parallels Desktop® for Mac Enterprise Edition (www.parallels.com/business) — the best way to provide Windows applications on Macs in a corporate environment. Now IT managers can support Windows applications for Mac users with a configurable, policy-compliant solution that easily fits into existing IT business processes. New features allow administrators to select and enforce a USB device policy, install OS X guests using a NetBoot image from a server on the corporate network, encrypt OS X virtual machines with the help of the FileVault encryption feature built into OS X, and check the status of licenses and reclaim seats directly. Built upon the world’s best-selling Mac desktop virtualization solution, it adds centralized administration and management capabilities as well as enhanced security to keep IT in control of virtual machines. “Parallels Desktop 10 is - quite simply – remarkable. 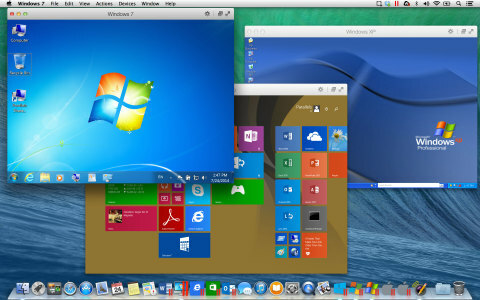 I've been a user of Parallels Desktop since version six,” said Steven Z. “I installed OS X Yosemite Developer Preview as a virtual machine (VM) within Parallels Desktop 10. It works like a dream. I like the idea and ability to configure before launching a VM. I love the Parallels Desktop Control Center - it looks elegant. I especially like the option to use compact or expanded views. Installation and integration is seamless. I installed Windows 7 and this worked flawlessly within Parallels Desktop,” said Mike B. “Parallels Desktop 10 running Windows 7 Ultimate is running great! I love the smooth interface between Windows on Parallels Desktop and going to my Mac OS,” said Roland S.
Parallels Desktop 10 for Mac is available beginning Aug. 20th, as an upgrade for current Parallels Desktop for Mac users at www.parallels.com/upgradepd10. The full version will be available to new customers on www.parallels.com/desktop starting Aug. 26th. Packaged software will also be available worldwide starting on Aug. 26th. The standard retail price (SRP) of Parallels Desktop 10 for Mac is $79.99, and the Student Edition is available for $39.99. Upgrades for existing Parallels Desktop 8 or 9 for Mac customers are US$49.99. Parallels Desktop 10 for Mac customers receive a complimentary three-month subscription to the Parallels Access app (www.parallels.com/access) for up to 5 Macs and PCs and an unlimited number of iOS and Android mobile devices. Parallels Desktop for Mac Enterprise Edition software is available via www.parallels.com/business. Parallels Mac Management (www.parallels.com/mac-management) plugin for Microsoft System Center Configuration Manager (SCCM) extends your existing SCCM infrastructure to discover, enroll and manage Macs just like you do PCs, through a single pane of glass. From deploying Mac OS X images to managing virtual machines running in Parallels Desktop for Mac Enterprise Edition, it's everything you need to be a Mac management expert. Parallels is a global leader in hosting and cloud services enablement and cross platform solutions. Parallels began operations in 2000 and is a fast-growing company with more than 900 employees in North America, Europe, Australia and Asia. Visit www.parallels.com for more information. Stay connected with Parallels and our online communities: Like us on Facebook at www.facebook.com/parallelsdesktop, follow us on Twitter at www.twitter.com/parallelsmac, and visit our blog at http://blogs.parallels.com/consumertech. 1 Parallels Desktop 10 for Mac and Parallels Desktop 10 for Mac Enterprise Edition has experimental support for many of the features of OS X Yosemite Developer Preview, bringing them to Windows and Windows applications. However, we do not provide technical support for it at this time. Parallels plans to fully support OS X Yosemite in Parallels Desktop 10 when Yosemite becomes commercially available.